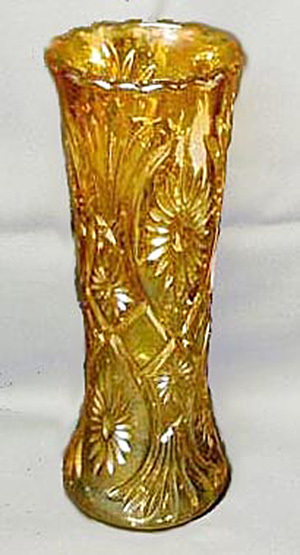 In their 2001 book, A Century of Carnival Class, Glen and Stephen Thistlewood say: "Marguerite is a rare vase, in fact only one marigld example is known so far. We believe that it was made by Brockwitz on account of the 'house style"--in particular the mould work and typical shape of the vase." The vase at the left sold on eBay in 2006, making it at least the second one known. It brought $153.